Saturday marks the centenary of a British general gunning down unarmed Indians who had gathered peacefully in a park in Amritsar. In India you only have to mention the name of the park, Jallianwala Bagh, for everyone to know what you are talking about. Yet hardly anybody in the UK has heard about Jallianwala Bagh, let alone knows why the event was one of the worst atrocities of British rule in India. Nor do they appreciate why its legacy still lingers, and colours relations between the UK and India to this day. Then, after the war ended, instead of liberty the British responded with draconian powers of search and arrest without warrant, and detention without trial. The Indians called it na dalil, na vakil, na appeal — no argument, no lawyer, no appeal. Tensions escalated, leading to British troops killing about 15 Indians; in retaliation five British civilians were killed, and telegraph wires connecting Amritsar to the outside world were cut. 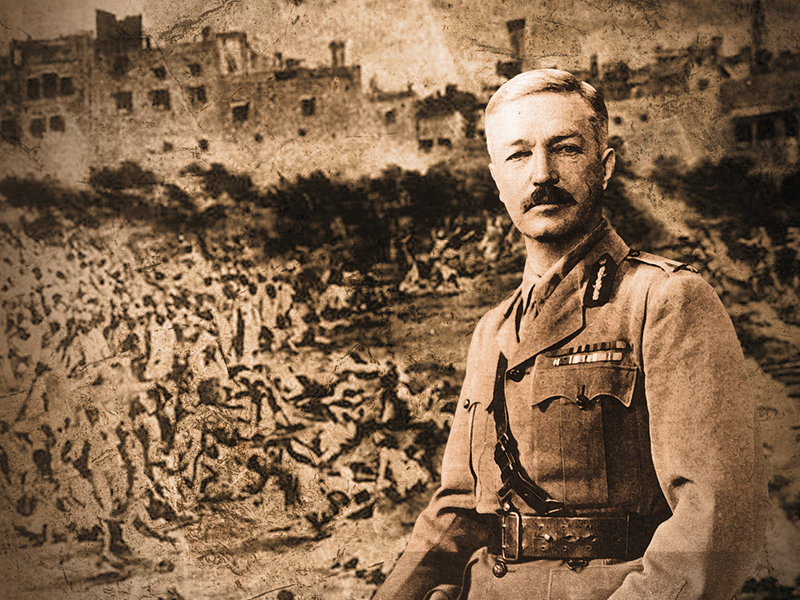 On April 13, 1919, General Reginald Dyer marched in. Dyer led a small party of soldiers to Jallianwala Bagh, an open area of six or seven acres surrounded by high walls in the heart of Amritsar. There 15,000 to 20,000 had gathered, including women and children, some to discuss politics but most to celebrate Baisakhi, the great Sikh festival. Without any warning, and just 30 seconds after he entered the park, Dyer ordered his soldiers to fire. They fired for 10 minutes and stopped only because they had run out of ammunition. By then 337 men, 41 women and a baby of seven weeks had been killed, with another 1,500 injured (the Indians claimed more than 1,000 were killed.) And the carnage could have been even worse. The alley that led to the Bagh was too narrow for Dyer’s armoured cars, otherwise he would have taken them in and used their machine guns. The Morning Post started a Dyer fund which gave him £26,000 (£1.15 million in today’s money). By contrast, each dependent of an Indian killed by Dyer received Rs500 (£176 today) per body. When he died in 1927, Dyer was given an unofficial state funeral with his coffin borne on a gun carriage through Admiralty Arch. In 2013, David Cameron became the first British prime minister to pay his respects at the memorial. But while admitting it was a “deeply shameful event” he felt you could not “reach back into history” to apologise. Today, Indians are indeed reaching back into history and demanding an apology. Though in the years after independence, India’s first prime minister, Jawaharlal Nehru, stamped on efforts to mark the event, now Indian politicians such as Shashi Tharoor want the British to apologise for the empire and even pay reparations. It is comforting for the British political class to talk of the Commonwealth as a unique family with many shared memories. The fact is there never was such a family. The British Empire was at best a real-life Downton Abbey, the black and brown people occupying the downstairs, while the whites had the upstairs. For Indians, Jallianwala Bagh is a reminder of what they call Angresso ki Ghulami, the slavery of the British. The word slavery will make many British bristle, but they need to understand why the Indians feel this way. For Indians, Jallianwala Bagh challenges the myth that British rule was benevolent. Both Narendra Modi’s ruling BJP party and the opposition Congress, fighting the Indian elections until mid-May, are united on this issue. And, with Brexit on the cards, a Britain that seeks to boost its trade with India needs to learn quickly that the legacy of Amritsar has to be addressed and not ignored — or, worse still, forgotten. Mihir Bose is the author of From Midnight to Glorious Morning? India Since Independence.